30th June 1989 Omar al-Bashir assumed office as President of Sudan. 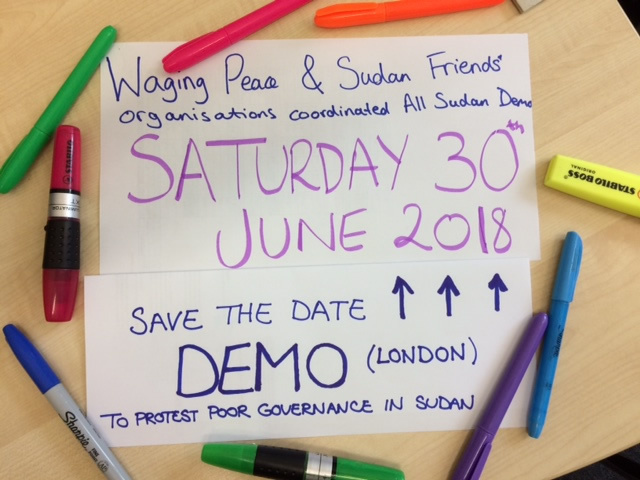 To mark this anniversary, and in protest against poor governance in Sudan, campaigning NGO Waging Peace is holding a demonstration on the 30th June. Waging Peace campaigns against human rights abuses in Sudan. Having been founded in 2004, at the height of the genocide in Darfur, they initially focused on this conflict, but have since covered atrocities in all corners of Sudan. In recent years many have been keen to suggest that violence in Sudan has largely abated, and with other emerging conflicts moving higher up on the agenda, Waging Peace are campaigning to ensure that the multiple crises in Sudan are not forgotten among members of the international community trying to normalise relations for their own benefit. Waging Peace also founded a ‘complementary’ sister organisation – Article 1. Named after Article 1 of the Universal Declaration of Human Rights, 1948: ‘All human beings are born free and equal in dignity and rights’. The organisation helps Sudanese asylum seekers and refugees to build meaningful lives in the UK. Members of the Sudanese diaspora will be attending in their hundreds on June 30th, and ensuring their voices are heard. Please join them. 2003 marked the start of the conflict in Darfur: rebel groups who accused the government of favouring Arab Sudanese began a rebellion to which the government retaliated with the support of Arab militia, the Janjaweed. Bashir’s regime targeted the non-Arab population – most severely affecting citizens. The government committed a series of human rights violations including persecution based on ethnicity and religion, sexual violence, and mass arson. With the help of organisations such as Waging Peace, who collected children’s drawings of the genocide used as contextual evidence of his crimes, Omar al-Bashir was indicted by the International Criminal Court in 2009 for war crimes and crimes against humanity. In 2010, the count of genocide was added to President al-Bashir’s indictment. He is yet to face formal consequences and continues to serve as President to this day. In 2014, 3000 villages were destroyed during attacks over the course of the year. November that year, media reports showed that 200 women and girls had been raped by Sudanese soldiers in Talbit. Conflict was re-escalated by the Sudanese government in February 2015. Local militias retaliating against the government have been militarised and even involved in inter-communal conflicts. The government was reported to have launched chemical weapon attacks on civilians in September 2016. These inhumane attacks killed at least 250 people – with the majority of victims being children, but were never formally investigated or punished. Over 3 million people are now internally displaced leading to one of the world’s worst refugee crises. Many refugees are living in camps in Darfur and Chad. The United Nations has since decided to withdraw a number of peacekeeping troops in the region and drastically reduced funding allocated to the country by 55%. This has rightfully resulted in fears that the conflict will worsen, with fewer voices to speak out for Sudan’s people. Meanwhile, European governments are bringing Sudan back in from the cold to try and secure some easy wins on migration, counter-terrorism, and trade. The UK government itself is conducted a high-level dialogue on these issues, and downplaying evidence human rights abuses to curry favour. Sudan is not the kind of partner we need post-Brexit. Get involved If you believe that these atrocities are wrong and want to help raise awareness, then you can get involved by attending the demonstration being held by Waging Peace! We would love to see you there. This blog post was a collaboration between Shereen Nassuna, one of STAND UK's Regional Organisers, and Maddy Crowther who is Co-Executive Director for Waging Peace.